This wilderness area is home to some of the most ancient old-growth virgin forests in the nation. Take in the beauty and majesty over the course of this 12-mile loop hike. The Joyce Kilmer-Slickrock Wilderness stretches across eastern Tennessee into western North Carolina, encompassing 17,394 wooded acres in the Nantahala and Cherokee national forests. This area embodies the rare beauty of old growth, virgin forest- an oasis of ancient trees that escaped the human blade. These woodlands have remained untouched for hundreds of years, with trees now as tall as 150 feet, and they represent a unique and extremely diverse type of forest found only in the Appalachian Mountains: yellow pine, hemlock, sycamore, basswood, dogwood, beech and oak. The wilderness is named for Alfred Joyce Kilmer, a New York Times reporter from 1913 to 1918 but more notably the author of the poem "Trees" ("I think that I shall never see/ A poem lovely as a tree."). Kilmer died in action in World War I, and this memorial was created after a group of veterans petitioned the government to honor him. It is fitting that this remnant forest has arguably the single most impressive growth of eastern virgin forest in the United States.In 2004, recognizing the great importance of this area as a habitat corridor, the U.S. Forest Service recommended an additional 1,836 acres for wilderness designation, just across the Little Tennessee Gorge. One of the best hikes in the southeast can be found in the Joyce Kilmer-Slickrock Wilderness. 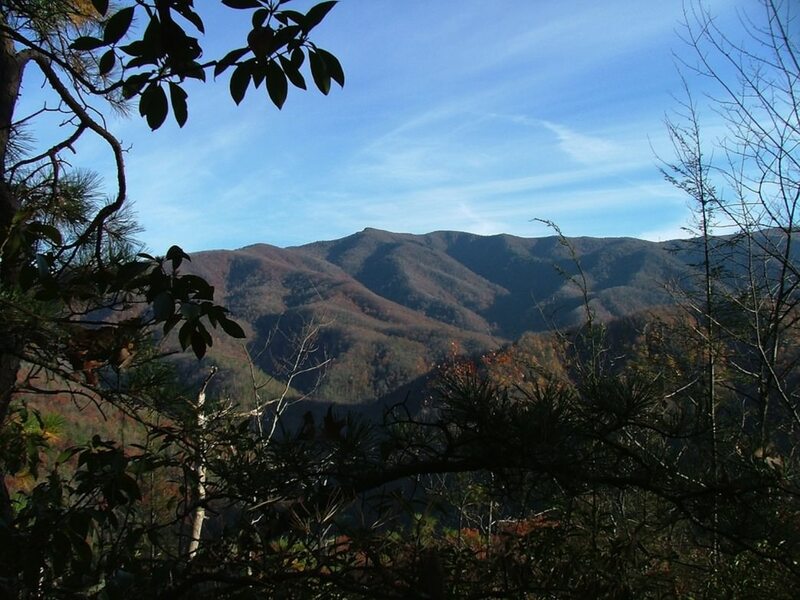 It's a 12-mile loop hike that begins at Farr Gap and links up with several different trails in the Tellico Ranger District of Cherokee National Forest. This is a strenuous trek, which could theoretically be done in a day, but which should probably be broken up into two days in order to fully and intimately experience the beauty of this area. If you hike this loop clockwise you will use the Stiffknee Trail, Slickrock Creek Trail, Big Stack Gap Branch Trail and the Fodderstack Trail to get you back to the Farr Gap trailhead. The Stiffknee Trail portion (3.4 mi) borders a proposed wilderness addition and leads into the Joyce Kilmer-Slickrock Wilderness, before steeply descending to the headwaters of Little Slickrock Creek. As you cross this creek on a number of occasions, you may see where portions of the trail follow an old railroad bed. The second leg of the loop trail, Slickrock Creek Trail (3.1 mi), follows the creek with eight water crossings, and hikers can dip into the plunge pools at Wildcat Falls. Great campsites can be found all along this segment of the loop. Slickrock Creek has a population of native Brook Trout, and is popular with fly fisherman. A half-mile beyond the falls begins the third portion of the hike, Big Stack Gap Branch Trail (1.8 mi). This trail includes a gut busting 1,500' climb away from the creek until you reach the ridge and connect with Fodderstack Trail (3.7 mi). Be careful at this trail junction. Be sure to consult your map, as you do not want to make a wrong turn here. Straight ahead (slight right) will take you back to your vehicle at Farr Gap.As you walk the ridge back to your vehicle, the Citico Creek Wilderness will be on your left, and the Joyce Kilmer Wilderness on the right. This final segment of the loop starts with a gentle downhill then climbs steadily to Little Fodderstack Mountain. Expect the trail to undulate after passing Little Fodderstack. The last half mile to Farr Gap is a steady downhill.This loop is absolutely gorgeous, but it's also pretty challenging- especially if attempted in just a day. From Knoxville: take U.S. 411 south to Madisonville, then take SR68 south toward Tellico Plains. At Tellico Plains, get on SR165 (Cherohala Skyway) and follow the signs to Indian Boundary Campground, 14 miles from Tellico Plains. At Indian Boundary Campground, turn right onto Forest Service Road 35-1 to Citico Creek. After 3.9 miles, turn right at the bridge over Citico Creek onto Forest Service Road 2659, and it's 6 miles to the Farr Gap parking area and Stiffknee Trailhead, both on the right. With its wide variety of terrain and elevation ranges, the area is popular with hikers and horseback riders who frequent the Benton MacKaye Trail, which runs through it. Hikers should consider carrying a map and a compass and know how to use both. You can contact the ranger station by calling 423-253-8400.